This boat is in average condition and not currently seeing much use. The current owner claims all systems are in working order presently. One noted recent problem was with a sticking cable, intermittent problem putting port motor into reverse. She is located on Lake Champlain in Vermont on fresh water. She has been a freshwater boat for the most part. Please contact your Representative or inquire through this listing should you need more information or would like to schedule a showing. We have not yet been on this particular vessel. All information in this listing is believed to be accurate and correct but at the present time has not been personally verified. We encourage all inquiries and questions relating to the boat, its present condition, accuracy of details including but not limited to its location, engine hours, service history, listing status and features. Stock #171842 ALL OFFERS CONSIDERED! MUST GO! PRICE DROPPED! Ready for your year around camping on the water! Fully enclosed camper canvas!! MUCH MORE INCLUDED!!! If you are in the market for a motoryacht, look no further than this 1987 Sea Ray 270 Sportfish, just reduced to $10,400 (offers encouraged). 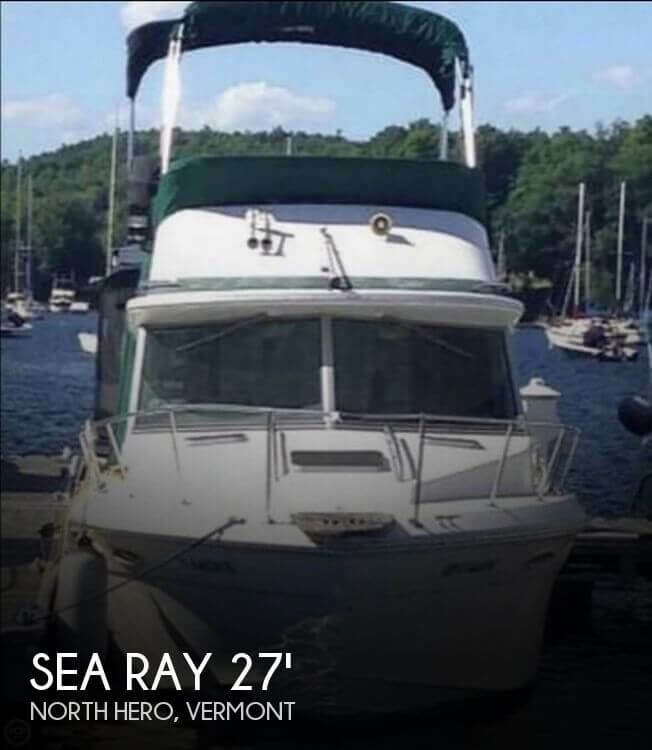 This boat is located in North Hero, Vermont and is in decent condition. 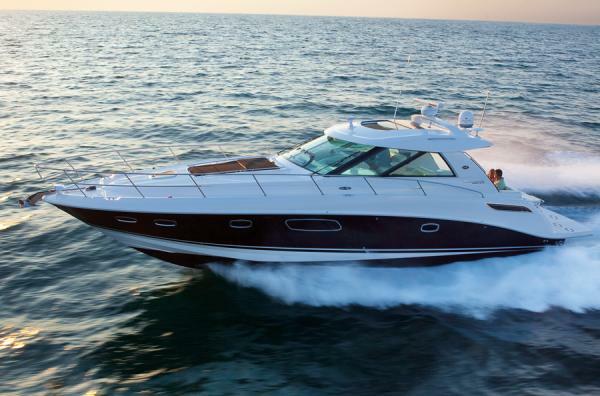 She is also equipped with twin Mercruiser engines that have 1,000 hours. The vessel is in great condition, One owner since 2016 with 49 hours on the engine. 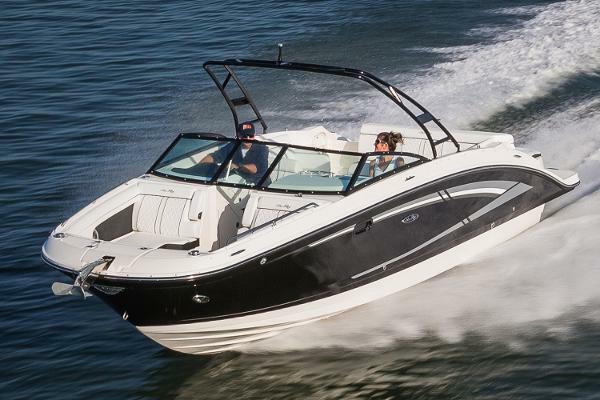 The boat is still under full warranty until January of 2019, with partial warranty continuing past 2019. Wrapped when stored during the winter Stock #148755 Open Bow, like NEW, barely used! Ready for a summer of FUN! 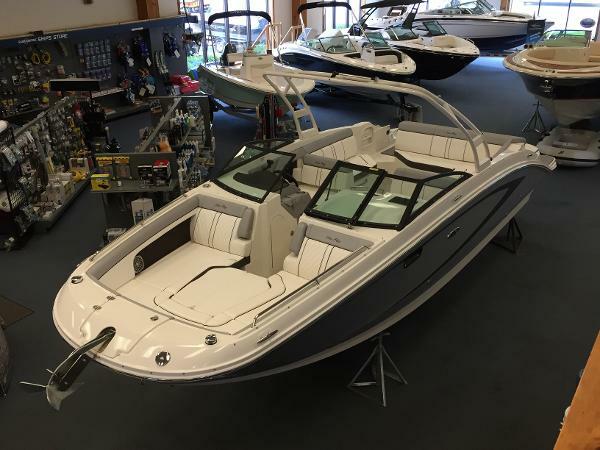 If you are in the market for a bowrider, look no further than this 2016 Sea Ray 210 SPX, just reduced to $39,000 (offers encouraged). 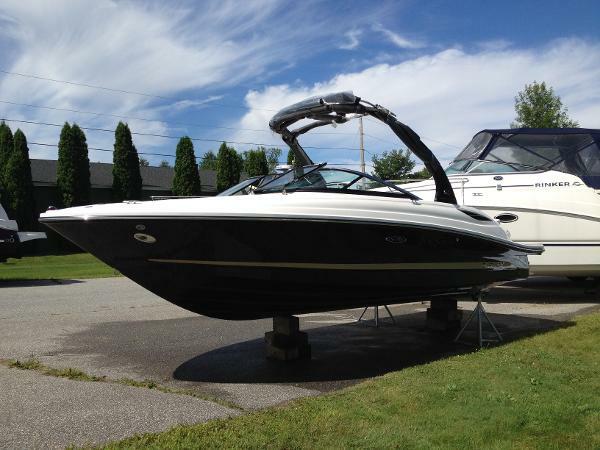 This boat is located in Swanton, Vermont and is in great condition. She is also equipped with a Mercruiser engine that has only 68 hours. Reason for selling is looking to buy a larger boat. 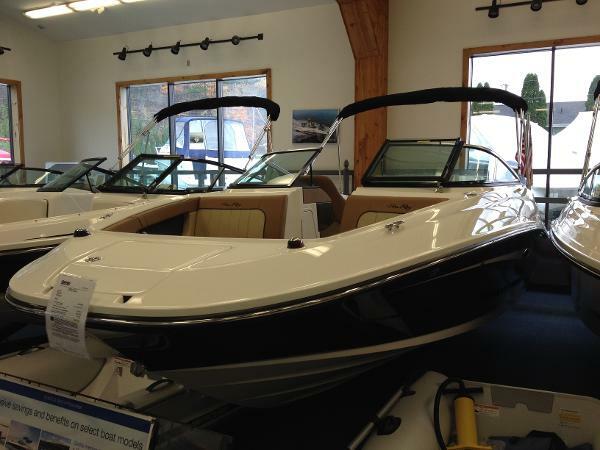 2014 Sea Ray 220 Sundeck White and Black with Black Canvas and Caramel/Tan Interior. Powered with a Mercruiser ECT 5.0L MPI Bravo III (260 HP)Options Include: Mooring Cover, Indirect Cockpit Lighting, Raymarine A65 Chartplotter, Cockpit Table with Dedicated Storage, Bow Filler Cushion, Pump Out Head, US Flag Pole. For more information please give us a call, email or stop by. Thanks. 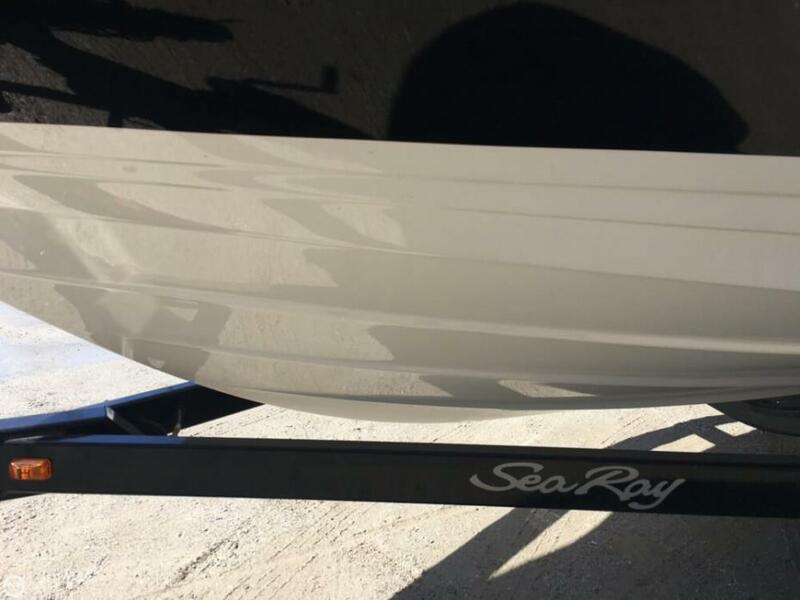 2016 Sea Ray 230 SLX ALL NEW FOR 2016 - 230 SLXN - Full solid hull color blue, with rally red gel stripe. Powered with Mercruiser 4.5L (250hp) Bravo III duo-prop outdrive. Options Include: 2nd Stereo Remote, Blue LED Light Package, Bow Filler Cushion, Cockpit and Bow Cover (blue), Cockpit Table with Dedicated Storage, Docking Lights, Dynamic Electronics Display (GPS chartplotter), US Flag Pole, Seadeck Swim Platform Matting, Submersible Swim Step, Stainless Windshield. 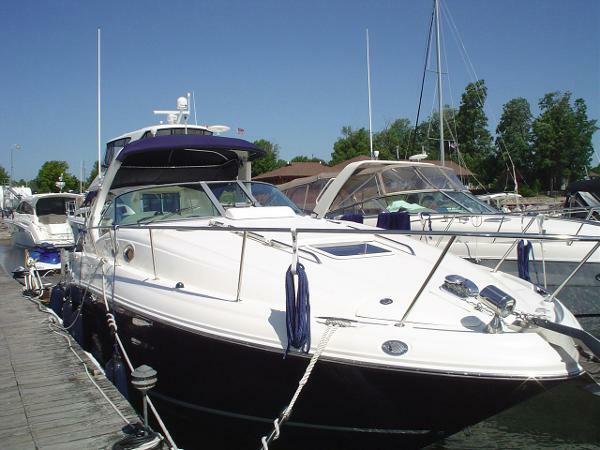 2007 Sea Ray 320 Sundancer New Listing! Very clean and well maintained. Second owner, 100% professionally maintained and stored. Powered with Mercruiser 5.7L 350 MAG MPI Horizon V-Drives with very low hours (300). Options Include: Air Conditioning, Generator, Vacuflush Head, Windlass Anchor, Spotlight, Raymarine GPS Navigation, Custom Camper Canvas, Cockpit Flatscreen TV, Snap In Cockpit Carpet, Central Vacuum, Premium Sound System Upgrade, Cabin Flatscreen TV. MUCH MORE! 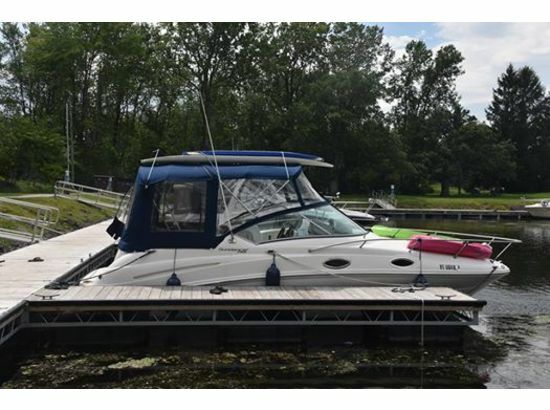 This boat is priced well and in excellent condition. Please call, email or stop by for more info. Thank you. 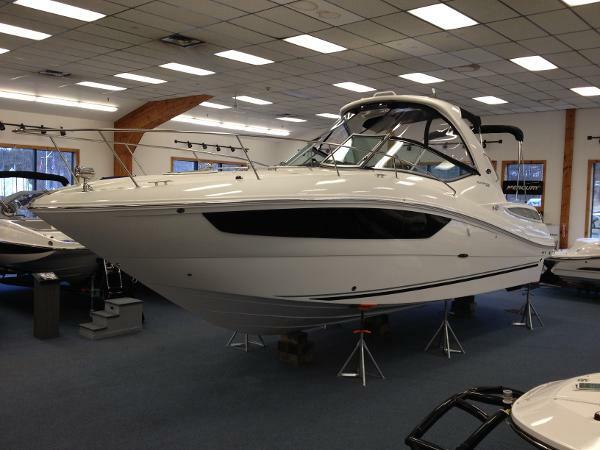 2017 Sea Ray 270 Sundeck Just in! Our most popular Sundeck model in beautiful three color gelcoat (horizon, sea ray blue, horizon). 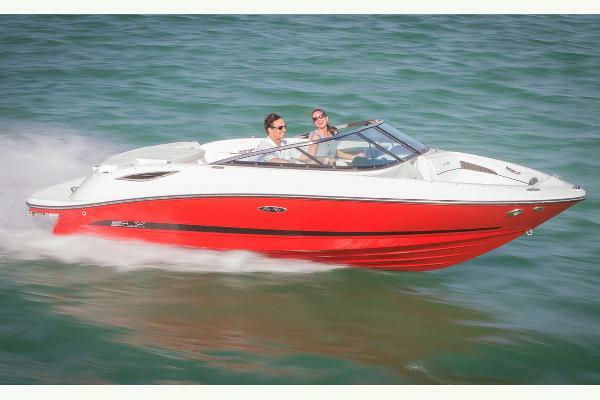 Powered with Mercruiser 6.2L MPI DTS Bravo III (300hp). 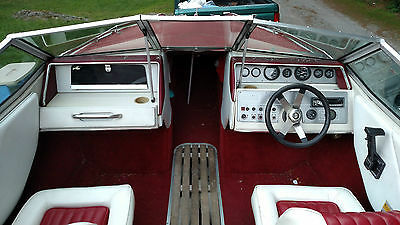 Options Include: Second Stereo Transom Remote, White Rub Rail, Dual Battery Switch, Blue LED Lighting Package, Bow Filler Cushion, Bow Table with Dedicated Storage, Cockpit and Bow Cover, Digital Dash (6" Display), Docking Lights, Faux Teak Insert, US Flag Pole and Base, Infinity Woven Vinyl Snap In Cockpit Flooring, Head Interior Upgrade, Trim Tabs, Mist (Pearl and Grey) Interior, Premium Stereo Upgrade, Submersible Swim Platform, Vacuum Flush Head with Holding Tank, White Aluminum Arch with Bimini, Windlass Anchor with Chain and Galvanized Anchor. 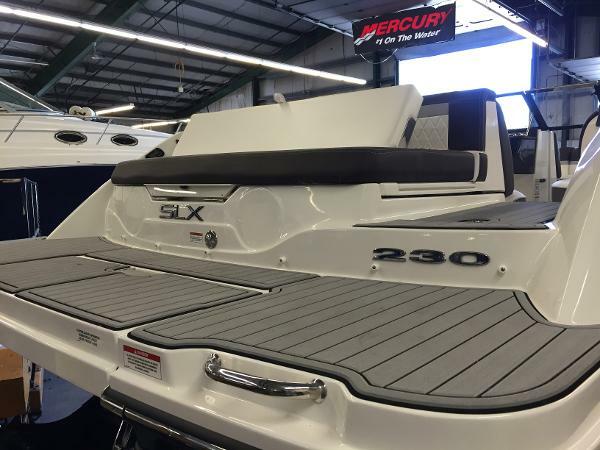 2014 Sea Ray 330 Sundancer DEALER DEMO - LAST ONE IN STOCK - Powered with twin Mercruiser 350 MAG MPI DTS - Featuring ALL NEW Axius Joystick Control System. White Hull, bronze interior, black canvas. Options Include: AC/Heat, Kohler Genset, Raymarine Chart Plotter/GPS, Windlass Anchor, 2 Cabin Flatscreen TVs, Premium Cockpit Sound System, Foredeck Sunpad, Spotlight, Cockpit Grill and Refrigerator, Extended Aft Bimini, Cockpit Cover, Extended Swim Platform, US Flag Pole, Gel Coated Dash. Financing available, trades welcome, please call email or stop by for more information. 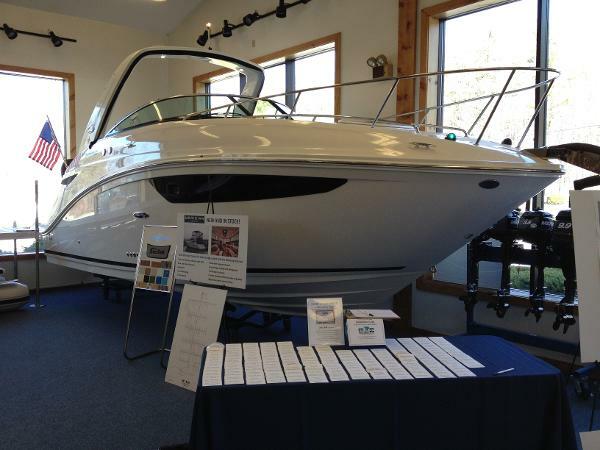 2014 Sea Ray 260 Sundancer ALL NEW DESIGN FOR 2014. White hull with Chestnut and Bronze Interior. Powered with Mercruiser 350 MAG MPI (300 HP) Bravo III. Options Include: AC/Heat, Bimini Camper Canvas Package, Alcohol/Electric Stove, Deck Hatch Screen, Digital Dash with Chartplotter, Fiberglass Sport Spoiler, Auto Fire System, US Flag Pole and Base, Gel Coated Dash, Head Interior Upgrade, Mid Sleeper Window, Snap In Cockpit Carpet, Sun Pad Foredeck, Teak Table, Flat Screen TV, Vaccuflush Head with Holding Tank, Windlass Anchor, Windshield Wiper. Please call, email or stop by for more information. Thank you. 1987 SeaRay Seville 19'. Boat runs very good. It only has 316 hrs. Although the boat isn't perfect it is in very good shape. The bow back cushion as seen in pics the wood is rotted. It needs a new piece of ply wood and to be re-stapled. The cushion in the back of the boat above the motor has the same problem. A very easy fix. The tilt and trim work as they should and all gauges except for rpm work. The boat has a Mercruiser 165 HP 4 cylinder engine with alpha 1 out drive. I replaced the Factory Voltage Rectifier (which burned out) and replaced with a 400.00 Alternator Conversion Kit. The good Alternator kit, Which charges the battery at idle and or any RPM. It also has a new prop. Boat also has Canvas covers. The trailer is included and has decent tires. Tread is great but has some small weather cracks. I pulled the boat all over long distances last year and never had a problem. Trailer also has bearing buddies. I need this boat gone due to moving.. So I would like a quick sale.